Classical figure drawing radiates with energy giving us the sense of the body's full range of strength, movement and vitality. 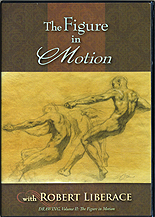 This dynamic approach infuses artwork with a kinetic excitement that is the hallmark of classical drawing. This video explores the tradition of energetic figure drawing by following the development of one of Rob's drawings from selecting, arranging and maintaining the pose, to the final accents. Total running time, 2 hours, 54 minutes.